Thank you for your interest in Neuro Amp EX. Please complete and submit the form below and an ADInstruments representative will aim to get in touch within one working day. If you’d like to speak to someone immediately, office contact information is available from the contact page. The Neuro Amp EX is a front-end device that extends the capabilities of the PowerLab system to record nerve activity using the microneurographic technique. As a low noise and high gain device, it is ideal for all recording environments requiring a wide bandwidth (100 Hz to 5 kHz) and a high signal to noise ratio. The Neuro Amp EX is a low noise and high gain neural amplifier device which makes it suitable for all recording environments requiring a wide bandwidth (100 Hz to 5 kHz) and a high signal to noise ratio. As a front-end device, the Neuro Amp gives researchers the ability to measure nerve activity using the microneurographic technique, when using a PowerLab. The Neuro Amp EX is fully isolated and suitable for both human and animal use. (Note: microelectrodes are not supplied). 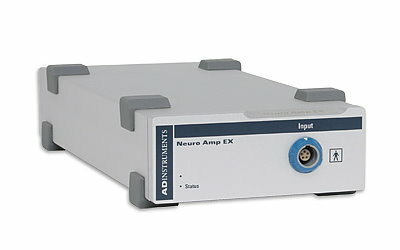 The Neuro Amp EX [FE285] is designed to allow the PowerLab system to perform isolated measurements of single-unit or multi-unit extracellular action potentials from single neurons or axons, from human or animal subjects. It consists of an electrically isolated differential input AC amplifier with an isolated ground connection. It is possible to ‘daisy-chain’ multiple Neuro Amp EXs to record from separate subjects, using separate grounds. *Please note that the Neuro Amp EX is not suitable for intracellular recording with glass microelectrodes. Only a single Neuro Amp EX may be connected to a single PowerLab. The Neuro Amp EX headstage provides a gain of 100 x with a 10 Hz High Pass filter. 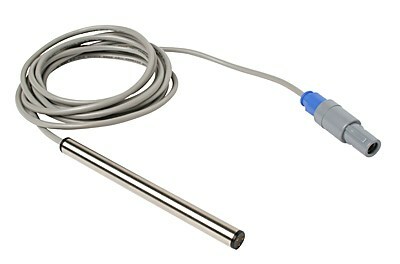 The cable shielding is directly connected to the casing, limiting the need for additional shielding at the input terminals. High-pass filtering: First order filter. Software-selectable: 100 Hz, 300 Hz. Audio output: Stereo jack with mono output; ±200 mV full scale, current limited to ±5 mA. Suitable for headphones or powered speakers. I2C port: Provides control and power. Equipment: Use only with an ADInstruments 35 series PowerLab. The PowerLab must be connected to safety earth via the power supply cable to ensure electrical safety.